The Rav was among the over 400 Rabbanim and Admorim who on Erev Yom Kippur, 1943 marched on Washington, DC demanding that the Roosevelt administration help save the Jews of Europe. Location: Section: 1, Block: E , Map: 42, Line: E, Grave: 14, Society: Kol Israel, along the hill on foot. There was a rabbi Gedalia Buchbinder in Bensonhurst, Brooklyn who passed away in 2007, I assume he was a son or grandson of this Rav. Rabbi Jacob Tevye Buchbinder was born on the 5’th of Aug 1878 in Lomza, Podlaskie, Poland to his parents Gedaliah Buchbinder and Mirka Marchewka. Rabbi Gedaliah Buchbinder was born on the 22 of Feb 1916 in Bialystok, Podlaskie, Poland to Rabbi Jacob Tevye Buchbinder and Bashi Buchbinder. Rabbi Gedaliah Buchbinder died on 12 Feb 2007 in Brooklyn, Kings, New York . 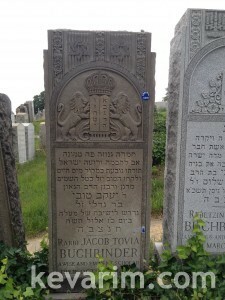 So Rabbi Moshe Yosef Buchbinder was Rabbi Jacob Tevye Buchbinder’s second cousin one removed.